The United States Congress designated the Bering Sea Wilderness (map) in 1970 and it now has a total of 81,340 acres. All of this wilderness is located in Alaska and is managed by the Fish and Wildlife Service. The Bering Sea Wilderness encompasses St. Matthew Island, Hall Island, and Pinnacle Island and is part of the larger Bering Sea unit of the Alaska Maritime National Wildlife Refuge. One of the largest seabird concentrations in the North Pacific (3.5 million birds) can be found here in summer, dominated by auklets, common eiders, old-squaws, gulls, murres, and puffins. Geographically, this Wilderness is the most isolated in all of America. It is a beautiful land carpeted with grasses, sedges, mosses, lichens, and heath, and formed by volcanic activity, rising more than 1,500 feet above the sea with sheer cliffs and waterfalls dropping dramatically into icy water. The annual average for visiting ships is fewer than one. On Saint Matthew you'll find one of the few colonies of northern fulmars on Earth, and almost the entire world's population of McKay's buntings nest here. Northern sea lions and seals haul out at several places, and walruses climb ashore at one spot on Saint Matthew. Reindeer, once introduced here, have disappeared. Arctic foxes den here, and polar bears, practically wiped out by hunting, wander over from the mainland occasionally on the winter ice pack. Gray whales are often seen offshore, and sometimes an endangered bowhead whale swims by in winter. Summer temperatures average in the low 50s and 60s (Fahrenheit) and in the low 20s and 30s in winter. The Bering Sea Wilderness receives 73.5 inches of precipitation, annually. 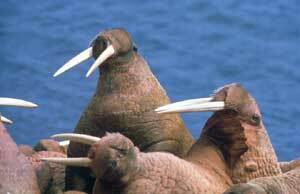 Planning to Visit the Bering Sea Wilderness? How to follow the seven standard Leave No Trace principles differs in different parts of the country (desert vs. Rocky Mountains). Click on any of the principles listed below to learn more about how they apply in the Bering Sea Wilderness.